Many people look back at their time on the Great Barrier Reef by viewing holiday snaps. Scientists have taken an even longer look back at the Great Barrier Reef via another sort of image caught in time - deepwater fossils - which reveal the important role the deepwater reef plays in the health of the whole reef. The research led by University of Sydney scientists Dr Liz Abbey and Dr Jody Webster, from the School of Geosciences in the Geocoastal Research Group, with colleagues from the Australian Nuclear Science and Technology Organisation, Universidad de Granada in Spain, University of Oxford in the UK, University of Edinburgh in the UK, Aix-Marseille Université in France, Queen's University Belfast in Ireland and University of California, Santa Cruz in the US, was published in the journal Palaeogeography, Palaeoclimatology, Palaeoecology on 9 October 2013. Dr Liz Abbey and Dr Jody Webster, from the School of Geosciences, analysed fossil coral samples as part of their world-first study on the deepwater fossil reef system in the Great Barrier Reef. This sample pictured is about 10 000 years old. As the first comprehensive study of its kind on the deepwater fossil reef system in the Great Barrier Reef, the results are the first analysis of the environments and timing these reefs developed in. These deepwater reefs are called mesophotic reefs and extend from 30 metres to 100 metres underwater. "My recently finished PhD student, Liz Abbey, and I looked at the mesophotic fossils, which are too deep to access via scuba diving, so very little research has been carried out on this type of reef around the world, especially in comparison with their more accessible shallow-water counterparts," said Dr Jody Webster. "Even in the low light, the modern mesophotic reefs support corals, sponges and algae as the dominant structural components. "We focussed on three fossil mesophotic reefs in the Great Barrier Reef and examined the timing of their development, analysed the species within each assemblage and uncovered the historical environmental settings for the reefs," explained Dr Webster. "Nothing was previously known about the long-term record of mesophotic reefs on the Great Barrier Reef, and in fact, mesophotic reefs have been rarely, if ever, analysed using their fossil records, so this study is a real first." 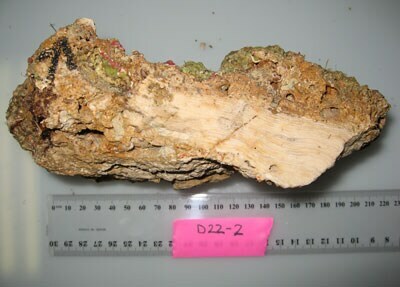 Using radiometric dating - carbon-14 and uranium-thorium dating - as well as analysing the sedimentary layers and paleoecology of the fossil reefs, the team discovered that the mesophotic reefs in the Great Barrier Reef had two specific periods of growth. One of Dr Liz Abbey and Dr Jody Webster's study sites off Cairns showing the deepwater reefs on the edge of the continental shelf. The fossil and modern mesophotic reefs grow on the terraces and reef-features between around 110 metres and 50 metres in depth. "We found that there were two distinct generations of fossil mesophotic coral community in the Great Barrier Reef - the first period was from 13 000 until 10 200 years ago, with a roughly two thousand year break, then the second period from 7 800 years ago until now," said Dr Webster. "This period of over two thousand years when mesophotic coral growth was interrupted happened when there was a massive sediment flux, with sediment moving from the reef shelf to the basin. 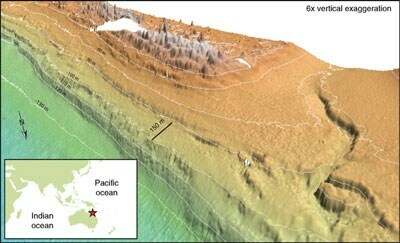 It appears that this huge movement of sediment happened as sea levels rose - flooding a huge area of the shelf during this time." The team are the first in the world to document and analyse the response of a mesophotic reef community to millennial scale environmental perturbations, and to see how the reef responds to global sea-level rise and environmental changes. "It's very important to see how the mesophotic reef has responded to these challenges in the past, as we may be facing some of the same environmental changes in the near future, especially with global sea levels rising," explained Dr Webster. "Modern mesophotic reef systems have been getting a lot of attention lately, because there is evidence that they might act as refugia for their very stressed shallow water reef counterparts. It's thought that mesophotic reefs could act as a source of larvae for shallow-water reef regeneration following disturbances," said Dr Webster. "Significantly, our findings suggest that while these mesophotic reef systems have been an important part of the Great Barrier Reef's geologic past over the last 20 000 years, they have actually been very sensitive to past environmental changes, such as sea level rises and increased sediment flux. This, of course, has relevance to how the modern Great Barrier Reef deepwater reef systems might behave in the future."